A short time ago, I was commissioned by French company Polyrey, to record one of their recent projects located in Aberdeenshire. Polyrey is a company which manufactures and supplies various types of High Pressure Laminate, Melamine Faced Plasterboard and other composite panelling and facing systems for applications such as:- Interior Fittings, Doors, Partitions, Cubicles, Worktops and External Cladding. The company was founded back in 1898, and today Polyrey has 620 employees in Europe, with its headquarters in Baneuil (France) and a strong commercial presence throughout Europe, the Middle East and North Africa. One of the 'Wet Areas' at Les Enfants Nursery. The project I was to photograph is a new installation of washroom cubicles/doors, and splash-backs/wall coverings which had been produced specially for a children's nursery in Inverurie, Aberdeenshire. The school, 'Les Enfants', had come up with their own very colourful designs for the surfaces, and Polyrey had manufactured these for them. 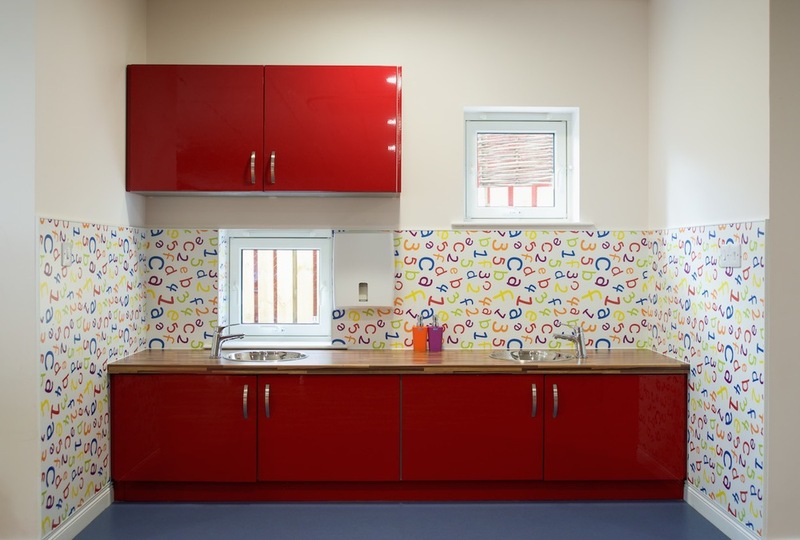 The shoot consisted of 4 'wet areas' in the nursery rooms, where the children could wash-up and clean things at sinks; a main kitchen splash-back; two multi-cubicle bathrooms, and a baby changing room. Gear wise, I had my D800, my 24-70mm, 18-35mm, and 50mm lenses, tripod, my light stands and other equipment with me on the shoot. During the shoot I utilised additional lighting, with at least one flash and modifier used in each of the photos, depending on the ambient lighting available in the locations. During the morning the weather was good, and lots of ambient light was available from the windows in some areas, so a light touch of fill was all that was needed. In other areas though, more light required to be brought in to even out the exposures and lift shadow areas acceptably, requiring some manoeuvring in corners and small spaces to get the light in the right areas without compromising the composition of the image(s). Due to the nature of the spaces, and because it is a working nursery school, I was shooting at the weekend when there was no-one else around. Although the spaces had been tidied and cleaned after the school week, there was still a lot of posters, signs, paintings and things like that which I had to remove from surfaces before taking any images. Once I had cleaned up the area I was photographing, a wipe down of the surfaces and visible areas, to remove any marks, fingerprints etc was done as well. As is obvious in the pictures, a lot of the cabinet surfaces are very glossy, and this created its own problems with reflections and glare from the flashes and lights - hence careful positioning of these was needed to avoid obvious or distracting hotspots, although in some cases the stainless steel sinks reflected almost everything like a mirror. This was an interesting interiors shoot in a different location, and one that required working quickly, carefully, and methodically to complete the photography in the arranged time. As stated above, there was a reasonable amount of area prep required, before pictures were taken, so finding a lighting solution that worked quickly was important, and I restricted myself to 40mins per area, so as to have a small amount of time left over at the end for any 're-do's' and to get some detail shots. Some more images from the shoot will be posted up in the Commercial section soon, so please head over there and check them out!